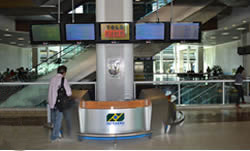 - When leaving the restricted area, go up to the 2nd floor and walk to the Information desk - INFO - International departure sector. - Our driver will meet you with a plaque "Shuttle Rio". - When leaving the restricted area, walk to the international arrival area. 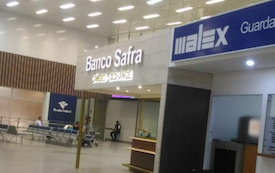 - Wait in the chairs beside to the SAFRA Bank and Malex (photo) - close to door D.
- At the scheduled time, our receptive will meet you with a SHUTTLE RIO sign. 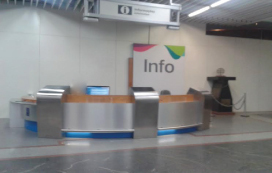 - When leaving the restricted area, turn left and walk to the Information desk of Infraero Departure Sector. - Our driver will meet you with a plaque "Shuttle Rio"